Facebook Messenger is about to make it easier for people from other countries to communicate with one another in Marketplace. At the F8 2018 developer conference today, Facebook announced M Translations, a Messenger and Marketplace feature that gives users the option to translate foreign text into their default Messenger language. When translatable text comes in, Facebook’s AI will register that the text isn’t in your default language and send you a “Translate to [default language]” pop-up. If you tap it, you’ll receive the option to translate any text sent to you by the account in the future. The other person will then receive a notification that you’re translating their text, so they know you can understand them. When asked for further details, a Facebook representative noted the company currently "[doesn't] have a date to share", though it hopes "to roll it out in additional languages/countries soon." As of now, M Translations will only available for Marketplace transactions, but Facebook plans to update the main Messenger app with M suggestions “in the coming weeks”. Facebook Messenger may have embedded games, Spotify playlists and tons of funny GIFs, but for Facebook, it’s all about business, which is likely why the Marketplace update was prioritized. 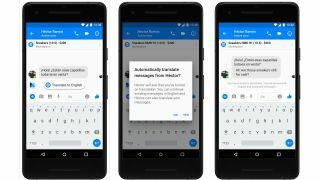 Facebook's 300,000 chatbots and adverts were built to sell stuff to users across the globe; with this update, Facebook’s business partners will have easier access to a wider selection of potential customers. Adding translations will also finally bring Facebook’s chat service closer to Google Chat’s level for international communication. Google has offered translations for Google Chat, and for other Android phone apps like Facebook Messenger, since 2015.